Why Eastern Burgundy? An opportunity to get the best of both worlds – within easy distance of the classic treasures of Burgundy and the famous Burgundy vineyards whilst also exploring some of the lesser-known delights of the region which most visitors by-pass on the way south. This is a wonderful area. Burgundy is rightly world famous for its wines and countryside but try the Jura. Most people have only heard of it through Jurassic era rocks & Jurassic Park films. John & Carolyn Scallan fell in love with it. Join them, you won’t regret it. Where to stay: Le Bourg B&B in Sens-sur-Seille (71 Saone-et-Loire) is is run by John & Carolyn Scallan who are English but happy to live in France, – a good job as they’ve been here for 6 years now. 4 bedrooms, all en-suite, and each with their own individual design welcome you. Two doubles, one twin and a family room for up to four. Evening meals can be arranged using as much as possible from theirur own garden.! Breakfasts with home made jams and PROPER marmalade, served on the terrace when fine. Les Trois Colombes just 300 metres from us. Run by two Swiss ladies this is a real treat. High quality food in calm and beautiful surrondings. The menu featuring “les trois filets” is superb. La Siesta Pizzeria in Bletterans (10 kms) Good value, great atmosphere and an all round enjoyable time. Proper size chips as well, not the thin “allumettes”. The Chicken Liver salad as a starter sets the tone. They do takeaways as well and, the height of nouvelle technologie they’ve got a “Pizzamatic”! A genuine Hole in the wall Pizza machine! Credit card in, choose your pizza (or two etc) and wait. Three minutes later the first will arrive and so on piping hot and in it’s own box – the wonders of technology! This region of France is called the Bresse and is famed for it’s poultry. Poulet de Bresse in Vin Jaune with Morilles is the region’s signature dish. Featuring the chicken (specially reared, free range chickens) and a sauce made of local mushrooms and the stunning powerhouse wine of nearby (4 kms) Jura. Obviously Burgundy. 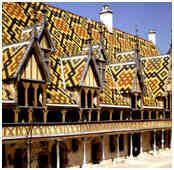 Beaune is 40 kms away and could lead you into serious trouble with your bank manager but it would be worth it. For a more affordable Burgundy try the Hautes Cotes du Nuits and Hautes Cotes du Beaune or the Cote Chalonnaise. The owners have contacts in all. For something different; head eastwards into the Jura and try their wines. The Vin Jaune (see above) is one of a range of amazing and highly individual wines from this smallest of wine regions. 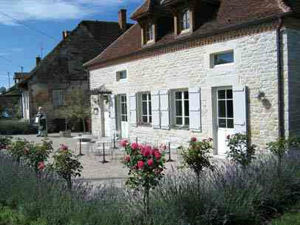 The owners of the B&B have contacts with several winemakers and can easily arrange tastings. The local Cremant (champagne but not allowed to call it that) from friends the Chevassus is stunning. Try it. St Germain du Bois (6 kms) on Saturday Morning (0900 – 1200) is a traditional morning market. Fruit & veg stalls, clothes, cheese (the B&B gets its cheese from here) butchery etc etc. The rotisserie chicken lady does a mean chicken with onions, tomatoes & gravy and a loaf of bread from either of the bakeries in the town with perhaps something naughty for pudd………..
Chalon sur Saone on Sunday morning. Mainly food market in the St. Vincent square. The cathedral dominates the sqaure and the market bustles along throughout the morning. Take a stroll through the old town, have a drink and watch the world go by. On Monday morning, Louhans has the largest market in the area, taking up the whole of the town centre, with food, clothing and household goods and livestock too. The Hotel Dieu in Beaune is spectacular, open all year from 9am to 6pm (closes for lunch only in mid-winter). The Chateau d’Arlay is open during June to September for visitors or all year long for it’s wine. The Burgundy winerouteTouristique des Grands Crus) is like driving through all the most famous names on a wine list! (Route The Jura countryside whose stunning scenery, including lakes, rivers, waterfalls, caves, vineyards, abbeys and castles. The hilltop village of Chateau Chalon. For something very different, how about lunch, a bit of culture, shopping and something for the kids all in one place? Sounds good? It’s at the local motorway service station!! No kidding! Just ask for details! Chateau de Pierre de Bresse has a local museum and lots to do for a morning or afternoon. The photography museum in Chalon sur Saone is worth seeing for some of it’s temporary exhibitions. La Maison de la Haute Seille is a new museum of the region aound Chateau Chalon with lots to do (open Sat & Sun from 9 to 12 and 2 to 6) . They are slowly getting the English translation sorted out for all of the panels and, hopefully, the audio side of things. The abbey at Baume Les Messieurs….. we could go on and on! Lac Chalain about 30 kms. Beaches, entertainment and the like. The Aurochs farm (www.ferme–auroch.com) ,(auroch= an ancient breed of cattle) near the Cascades des Herisson about 40 kms. Rare breed cattle, bison, Aurochs and, somewhat bizzarely, Dalmations. A car, frankly, is essential here. There are bikes available for hire so that the fitter amongst you can get a healthy buzz. If you let the B&B know the day before they can arrange a picnic lunch and recommend routes which are quiet and relatively flat to amble along. Should you be of a more Tour de France disposition there are longer routes of over 100 kms as well! Jazz festivals; Water festivals and a whole range of other festivals taking place over the summer months. Late September is usually harvest time and the vineyards are alive with people picking grapes. Louhans (about 10 miles away) has a market on Mondays all through the year. In summer it totally dominates the town. All the usual items plus hardware, fashion and livestock. Get there fairly early to get a good parking spot! Go wine-tasting at a local producer (or two). John & Carolyn have lots of contacts in the business and can set these up and sometimes accompany you. Visit the Jura wines website www.laroutedesvinsdujura.com for information on lots of small events in the region. There’s a tasting evening every Tuesday in season in nearby Lavigny that’s great fun but best if your French is fairly reasonable. For more info on Le Bourg B&B see Le Bourg B&B or use the enquiry form below.